We are now adding a range of new beautiful themes that can be used for various businesses. You can now select the newest theme for your business in the SimplyBook.me system and it’s versatile and fits most businesses. You just select your background banner, upload your logo and you are ready to go! Remark that if you are using a different language than english you may need to do the translation in Settings // Custom translations. 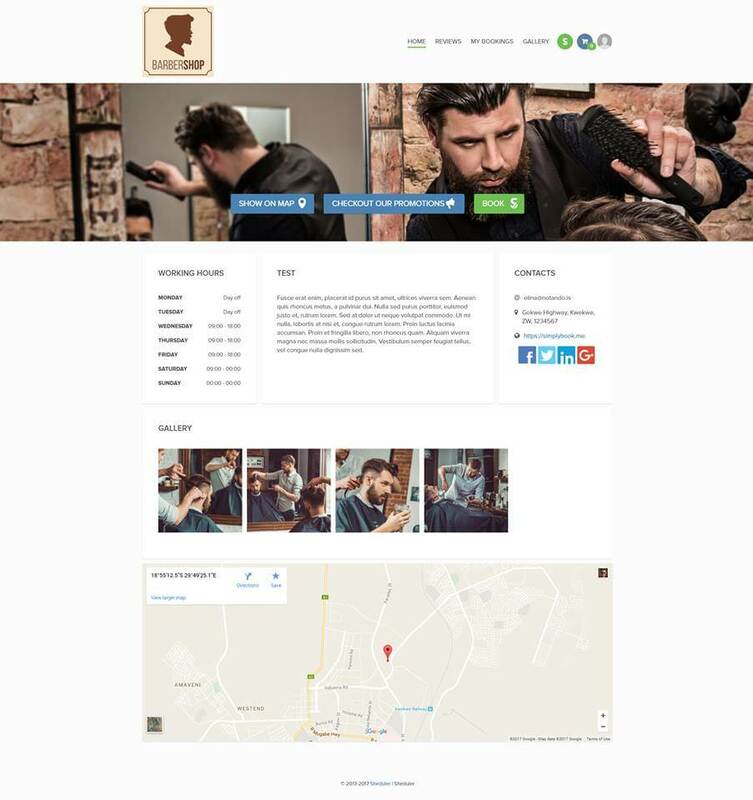 The theme you see in this post has been adjusted for the use of barber shop booking software and uses the photo gallery custom feature plugin to show off some cool images from the shop on the main page. You can of course use any photos, images and colors to make it suit your own business, whether it is for alternative medicine appointments, meeting rooms, boat renting, hair salons, yoga or whatever business you are in. This is not the only upgrade in the system because you can also activate the new login feature and have the clients login before confirming appointments. This avoids double client registrations and merging of clients. The login custom features also allows you to have ONLY your existing client base able to make bookings if you prefer to limit bookings and disallow new clients from making bookings. Yes, this sounds strange but it seems that some of our users have just such a full client database that they do not want to accept new clients. Remark: The login custom feature does not work with our old themes, you must change to the new theme for this to work! Also iFrame widgets and BookingTroll.com have not yet been updated with Login functionality. What will the initial email look like? Will the potential client just see a blank email? I like the idea of a Theme upon Client login. How do I do that? I love the new theme, but it does not support Custom CSS, which is a huge problem. I need the customization offered by Custom CSS (removal of Phone and Socials) and cannot revert to an older theme due to the aesthetic requirements of my team. Please enable Custom CSS on the new themes as soon as possible. Will be added real soon! If you use the Intake form feature you can ask anything you like!